Little Corellas are often found in country towns where they form large noisy flocks which are often regarded as a nuisance. They can cause considerable damage to trees and shrubs by stripping the leaves and to human installations by chewing off the outer insulation of electrical cables etc. Because of their habits and numbers they are often persecuted and culled. However, for those who care to watch them, they can provide considerable entertainment with their exuberant playful behaviour such as dangling from overhead wires by the bill or one foot, sliding off the roofs of silos and so on. Little Corella. Photo: John Spiers. 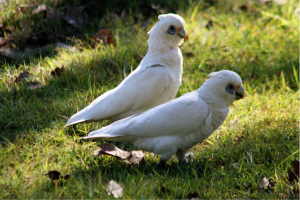 Little Corellas feed on the seeds of grasses and herbaceous plants, together with shoots, roots and blossom. They also feed on insects and their larvae. Large flocks can cause considerable damage to crops. The subspecies found in South Australia is C. s. gymnopis P. L. Sclater, 1871. 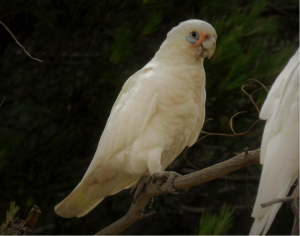 Little Corellas are medium sized cockatoos, all-white except for a yellow wash on the under-surfaces of the wings and tail, and having salmon-pink bases to feathers of the face and neck that are usually concealed. They have a noticeable blue-grey eye-ring which is much wider below the eye. The bill is short and bone coloured, the iris is dark brown, and the legs and feet are grey. The sexes are alike. Juveniles are the same as adults but have a smaller and paler blue eye-ring. The chicks have sparse yellow down. Laying occurs from May to October in South Australia in tree hollows. A clutch of 2-3 eggs is laid and the chicks are fed by both parents. After fledging the both chicks and parents join one of the large nomadic flocks. Little Corellas are common through much of South Australia (North west, Flinders Ranges, along the Murray river and the North-east), and are moderately common in many other areas (Mid-north, Muray Mallee and lower north-east). In only a few areas are they rare (Eyre Peninsula, Yorke Peninsula, the south-east and Kangaroo Island). Under natural conditions they like grassy woodlands, scrub and grassland. However, they have adapted well to manmade environments and can be numerous (and a nuisance) in small towns and farms when they form large flocks. They are strong fliers and can travel long distances to water and food sources.